Parks’ 10 Tots Aromatherapy Gift Sets make lovely gifts for nearly anyone, but can also become the ideal ‘present to yourself’, making any home more relaxing and welcoming. Each gift set consists of an assortment of 10 ‘tot’ size aromatherapy candles, hand-poured into glass votive mini vases. These fragrances can be used one at a time, of course, but are often most effective when combined in groups of two to three, creating a unique bouquet of fragrances to suit any mood or occasion. Each candle burns for up to eight hours. The Parks Nature’s Own 10 Tot Aromatherapy Gift Set contains the following scents. Each of our ‘tot’ aromatherapy candles are hand crafted by our expert team of candle creators. They start with some of the finest waxes available to create a burning medium that produces virtually no smoke, soot or inadvertent odour. To each batch is added a single scent, which is created by mixing 100% pure essential oils, botanical aromatics and/or premium exotic resins before being gently folded into the wax base. Finally, this mixture is poured by hand into a glass votive mini vase, around one of our top-quality smoke-free wicks. 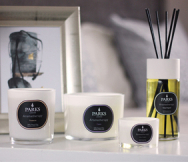 The resulting Parks candle will maintain a pure and energising scent every time you use it, guaranteed. The Nature’s Own 10 Tot Aromatherapy Gift Set comes in a presentation-quality gift box.